For those of you that are interested in radio listening, particularly over long distances (AKA DXing) with even a moderately directional antenna, having a great circle map projection for your location is a necessity. Looking at a Mercator Projection, the normal “flat” map most are familiar with, one might come to the conclusion that due west from upstate NY lays the Washington/Oregon state boarder. Appearances can be deceptive, bearing away at 270 degrees true (due west) from upstate NY is the California/Mexico boarder. This is because the we live on a big sphere. In this regard, the only place the the Mercator Projection is accurate is around the equator unless one is going due north (0 degrees) or due south (180 degrees). The further north or south from the equator, the less accurate a flat map is. Therefore, having a Great Circle map projection based on your location is handy for choosing the right azimuth to listen along. As with many things, the internet provides the required tools to generate a great circle map for any location in the world. The first thing needed is an accurate fix of your location. This can be obtained via GPS, or, if you know how to look at a map and or satellite picture, itouchmap can be very useful. 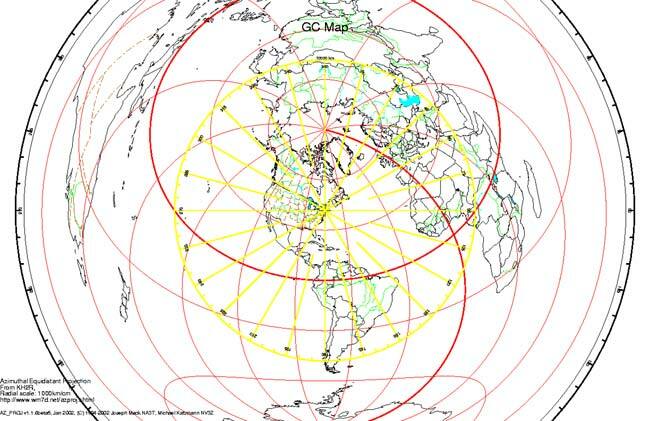 Once you know where you are, you can plug that information into this Great Circle Map Generator. One of the things that was drilled into my head when in the military was first aid, which we were all required to learn. Those of us that worked around high voltages were also required to know CPR, including passing the American Red Cross CPR course. I have used CPR on three separate occasions, none of the victims lived to tell about it. I have been told by my wife’s cousin, who is an ER doctor, that that result is fairly typical, especially in older persons with heart conditions, which in two instances was the case. I have always carried a standard first aid kit in my truck. Things like band aids, gauze pads, sterile water, Hydrogen Peroxide, medical tape, splints, antimicrobial cream, blankets, etc. Nothing hugely complicated, something like this unit. I have used it recently at accident scenes, which I tend to stop for if it looks like they need help. To complete this, I have also purchased an AED. As one medic once said, if a heart gets shocked out of sinus rhythm, it can be easily shocked back into sinus rhythm provided it is done quickly. Working on high voltage power supplies always entails some risk, even when all safety procedures are followed. As little as 60 mA can cause arrhythmia. Dry skin has a resistance of about 300 ohms, which means that 180 VDC is the threshold for fatal shocks. This value is much lower if the skin is wet. Any shock received through either hand is likely to travel through the chest and can effect the heart. Many of the transmitter sites we service are remote, medical help may be 30-60 minutes away under good conditions. Having an AED on hand is just a little bit of extra insurance, that will hopefully never have to be used. CPR procedures have been updated in the last few years, if one has not recently reviewed them, it might be worth while to take a refresher course. I will say, hands only CPR is an improvement not only because it is more effective, but also because most heart attack victims vomit and loose control of their bowls. Reduced contact with someone else’s stomach contents is always welcome. This AED came with a training video CD. 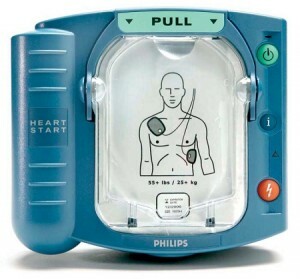 While AED’s are designed to be intuitive, having training on their use is always a good idea. The Red Cross also gives classes that include the use of an AED with hands only CPR. I have looked at my personal schedule, it is likely to be very light blog posting over the holidays as I am booked, booked solid I tell you. So, if I don’t get to say it, Merry Christmas, Happy Chanukah, Happy Festivus, Happy Saturn Festival, Happy Druid dirt munching dancing naked under a full moon, or whatever it is you celebrate. For my part, it has been an interesting year. It started out a little trepidus, what with my full time job being eliminated in January. I was fortunate to be re-employed part-time right away, many don’t get that luxury. Then, my wife returned to teaching full time, which made me, by necessity, a stay at home dad four days a week. There have been many changes, but in the end, everything has worked out rather well. While at home, I have worked on the blog and other ways to earn a little extra money. I can say that I am genuinely surprised by the reception this blog gets, both in the comments and off line e-mails and phone calls. I have enjoyed interacting with other industry professionals and bystanders, and although I might not agree with everyone on every point, I respect you all and value your input. I have found that while my engineering work hours are reduced, the amount of raw material for blogging is also reduced. I have also found that 14-15 posts per month is the right balance between quantity and quality, with the later being foremost importance. For as long as I have quality raw material to work with, I will endeavor to write about, take pictures of, and research issues that involve radio broadcasting. Next year will undoubtedly bring about more changes. I look forward to hearing from you and I wish you all well over the holidays and on into the New Year. Wow. Radiohead? Karma Police? WTF? I almost had a coronary. When I got home, I tried explaining this all to my then girl friend, who didn’t get it. Few do. At the time, making such an error would be very bad form indeed and likely open the unfortunate party to all sorts of snickering and finger pointing at the next SBE meeting. A quick glance at almost any circuit board these days will show that almost all of the components are surface mount. They are small rectangles or squares that sit on top of the circuit board. This is different from the through hole components that were used for many years and are still found in older equipment. There are radio engineers that feel that surface mount components are too hard to work on, thus the boards are not repairable. As with anything in the engineering field, there needs to be a cost/benefit analysis. Most computer components boards, things like NICs, modems, sound cards, VGA cards are very inexpensive and often times it would be more expensive to repair the board than it would to buy a new one. In other situations, however, local repair of circuit boards makes good sense and can be a good learning tool. 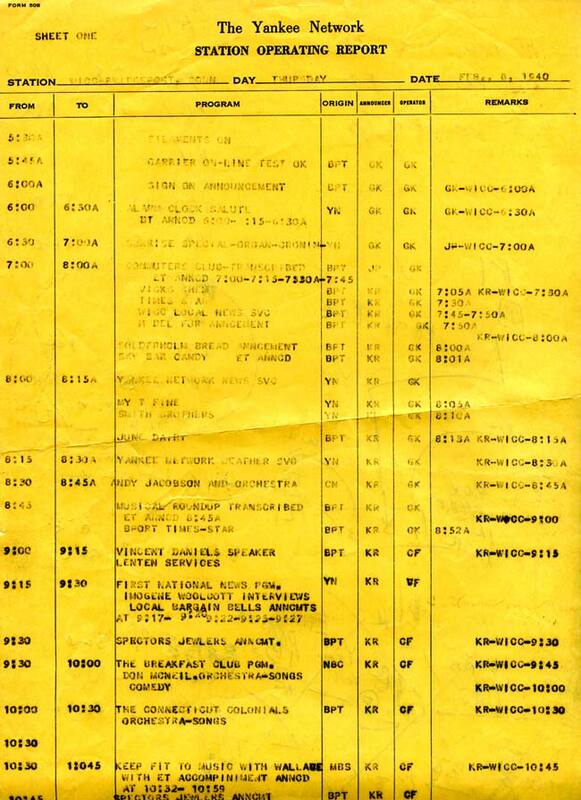 Consoles and transmitters offer some good opportunities for local repair, provided the schematics are available. SMT component trouble shooting is the same as through hole trouble shoots, except the components are smaller. That is where a magnifying glass comes in handy. 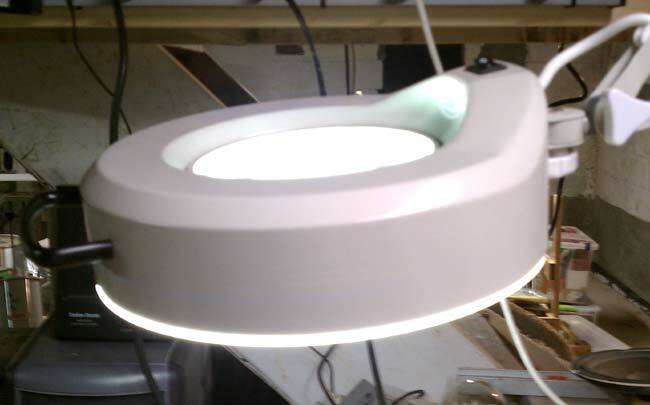 I purchased a magnifying glass/light to work on SMT boards. Soldering and unsoldering techniques are also different. A temperature controlled soldering iron with a small tip is important. 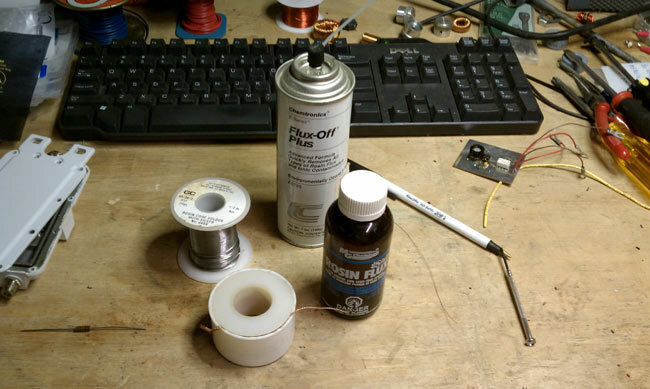 I find the easiest way to unsolder a component is with solder wick. 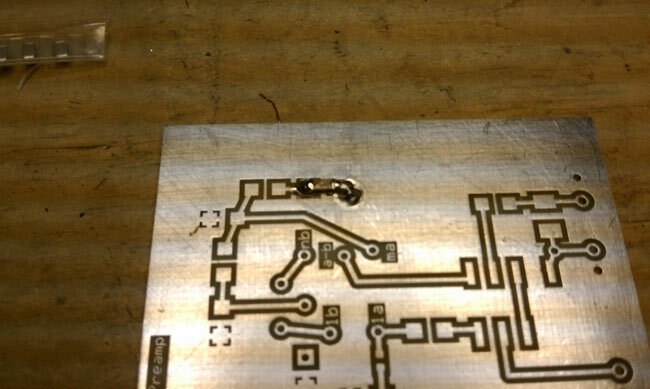 Once most of the solder has been wicked up, a brief touch of the iron and the component will come off. Small resistors and capacitors are fairly rugged, but should not be overheated. Semiconductor components such as diodes, transistors and ICs are susceptible to heat damage and Electro Static Discharge (EDS). A grounding wrist strap should always be used when handling semiconductor components. Soldering iron temperature should be enough to quickly melt the solder and heat the connection surface without overheating the SMT component. Lead free solder requires slightly higher temperatures than the traditional 60/40 rosin core. 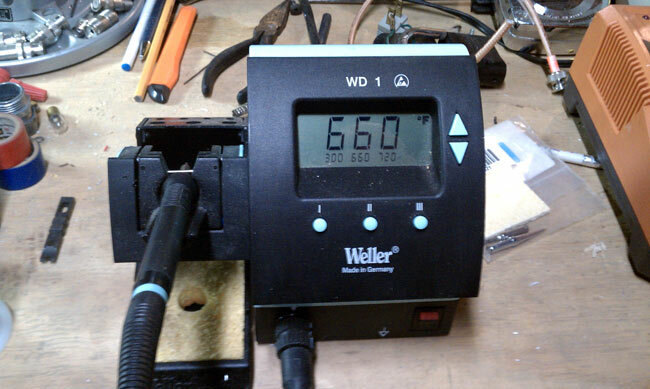 A temperature controlled soldering station is a must. Too much heat will damage components and boards, too little will make soldering SMT an arduous task. Other soldering supplies include liquid flux, desoldering wick, flux remover and 55/40/5 solder. The desoldering wick makes it easy to clean up an errant solder deposits and is the best way to desolder surface mount components. 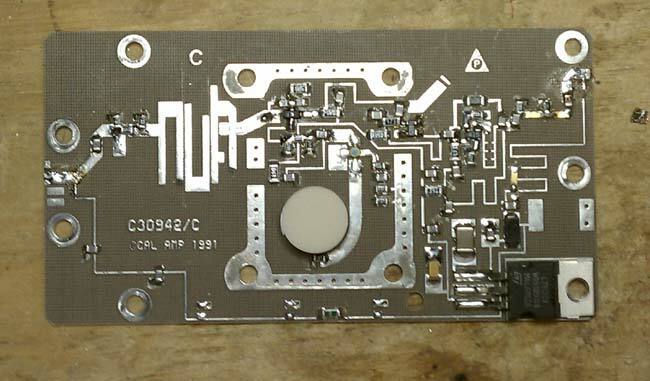 I have had limited success using a solder pump on surface mount boards. They do come in handy for RF MOSFETS, which have large tabs, often with liberal amounts of solder applied at the factory. 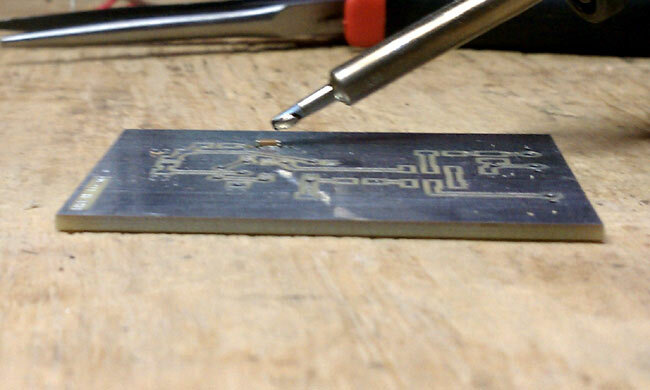 A typical 0.1 uf capacitor is placed on the surface mount board and ready to be soldered. These components are all small, but I would characterize this as a medium sized one. There are some very small diodes, ICs and other devices that require the magnifying glass to identify pins and polarity. The best way that I have found to solder components onto a surface mount board is to use a little bit of liquid flux on the board. Using tweezers or small needle nose pliers, place the component. Wet the end of the soldering iron with a little bit of solder. 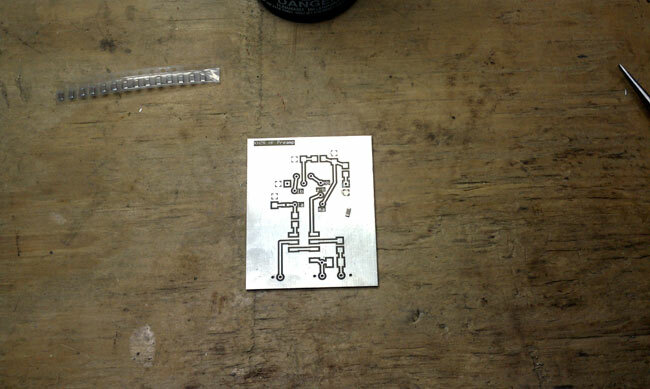 Using the placing tool, hold the component in place and touch one of the pads with the soldering iron. This should tack the component in place. Solder the component to the other pad using the soldering iron and solder. Then come back and touch up the tacked side. I have found that 600 degrees F is a good temperature to quickly melt the solder, while not heating up the component too much. Sorry I could not get pictures of the actually process, I don’t have enough hands to hold the soldering iron, hold the component down and take a picture. The completed preamplifier. I have been calling this an HF preamp, because that is its intended use. 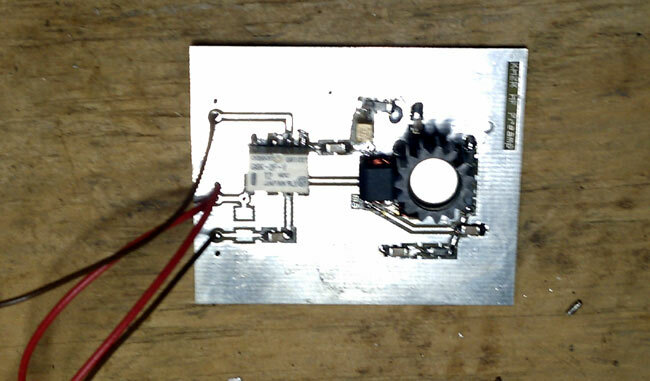 In practice, this preamp should work well from 50 KHz up to about 75 MHz, with 3dB points at 30 KHz and 100 MHz. The Norton design is an inverse feed back and using the 1N5109 transistor, which has input and output impedance of 50 ohms, makes it simple to implement. In testing, I found this unit has about 10-11 dB of gain with about 4 dB of noise. The use of SMT makes the design stable and I didn’t see any evidence of oscillations when testing it. More on the preamp here. I installed it out at the base of my K9AY antenna and it can be remotely turned on and off as needed. My main reason for wanting it is to overcome the 6.5 dB signal loss in the four port hybrid receiver coupler and transmission line I use. Truth be told, most of the time it is off. 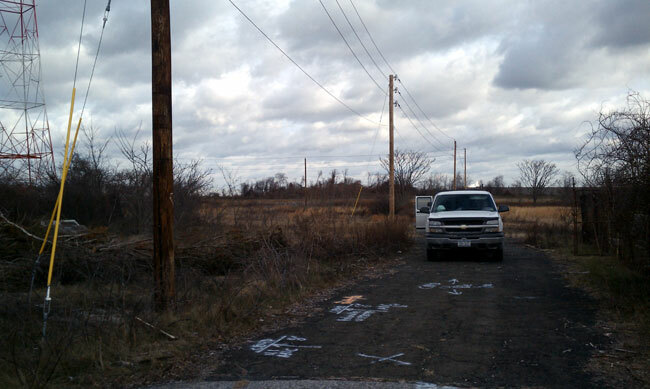 The WICC transmitter site, Pleasure Beach in Bridgeport, has been cut off from normal access since the bridge to the island burned in 1996. 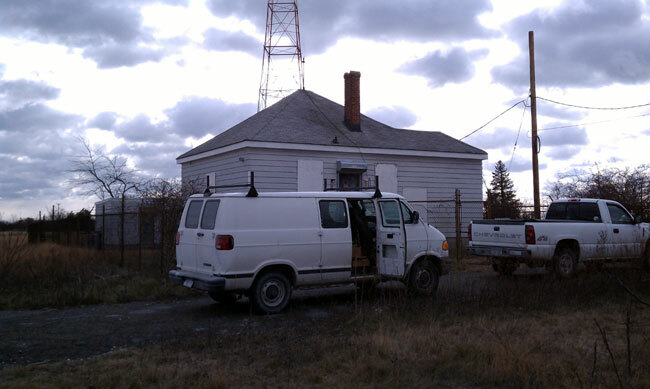 Since that time, access has been by boat with a 0.93 mile walk from the dock to the transmitter building. Have the power company replace the 3 phase circuit from the point where the under water cables come ashore to the transmitter building. All of these projects should greatly improve the reliability of the station. This should make Bill, happy, who appears to have a WICC chip implanted in his brain because every time the carrier is interrupted he posts about it on the radio-info.com website. The biggest issue with the site was the utility feed from the shore to the transmitter building. The original circuit was installed in 1936 when the station moved to the island. It was old and the poles were all rotting and had horizontal cross arms. Ospreys especially like the horizontal cross arms as they made good nesting spots. That is, until the nest shorts out one of the phases catches on fire and burns the top of the pole off. This has happened several times over the years causing many hours of off air time. United Illuminating, the local utility company, was very cooperative and installed new utility poles, wires, breakers and transformers, this time with a vertical phase arrangement, which should keep the Ospreys off of them. Additionally, the cottage removal project included installing Osprey nesting poles. 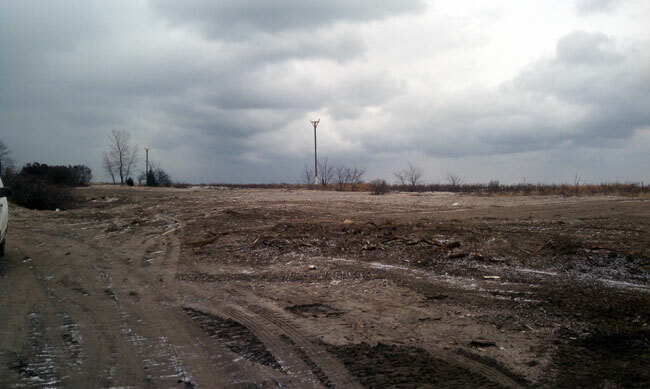 With almost all of the cottages now removed, the area looks much better than before. Actually, it should be a nice nature preserve and hopefully, the absence of the buildings might reduce the number of vandals in the area. The work is almost done, so the road is about to be taken up. This means we need to wrap up the work out there, so the final push is on. 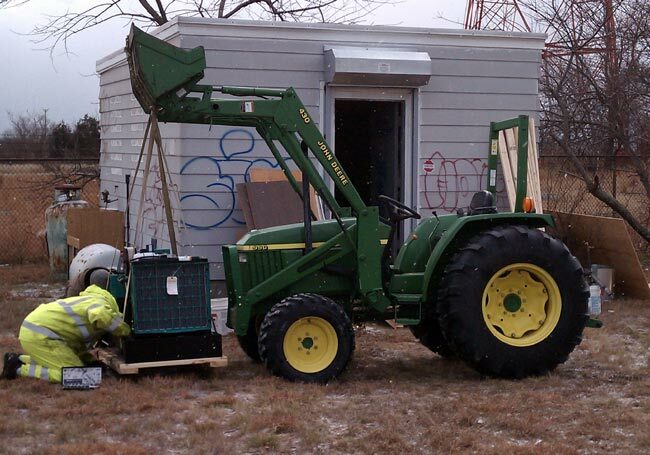 In the last three weeks, 10 truck loads of junk have been hauled out of the transmitter building and generator shack. Over 1,500 pounds of scrap steel, 640 pounds of insulated wire, 2,000 pounds of particle board furniture, old t-shirts and hats (something called “Taste of Bridgeport” which, if anyone knows what that was let me know), old propane tanks, batteries, etc. We also managed to fix the fence and gate in front of the building, cut down the over grown yew bushes and bittersweet vines. 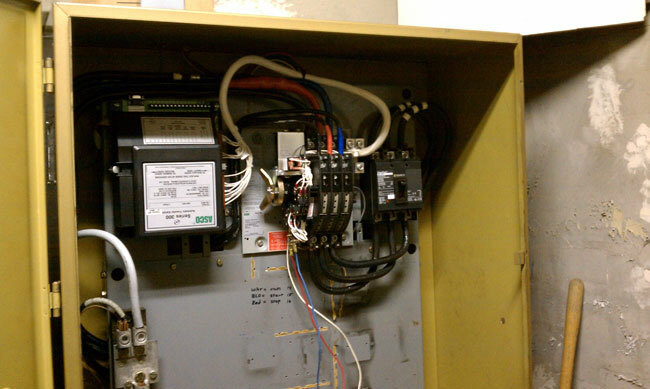 The old Kolher transfer switch was also an issue. There was no place to mount a new switch inside and mounting one outside is out of the question, so the guts from the Kohler switch were removed and replace with an ASCO unit. This was done in the summer of 2009. The breaker on the right side is the main service disconnect for the building, which was installed in September. Today, it was time to replace the Onan propane generator. 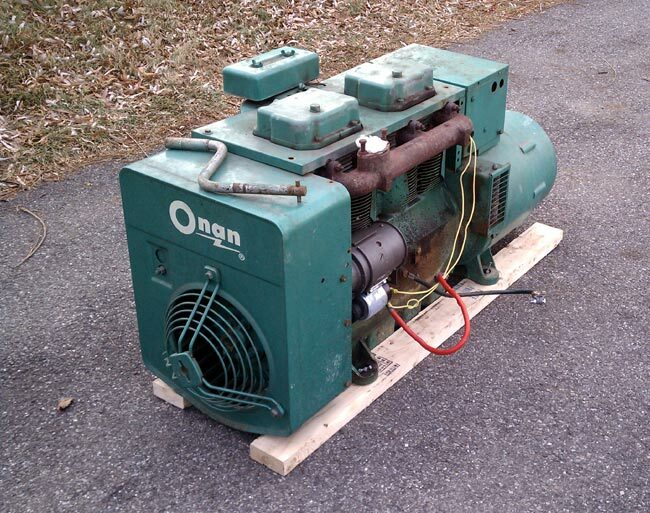 The old generator is an Onan 12JC-4R air cooled propane unit which was installed on April 4, 1969 at a cost of $1,545.00 new. For many years, this unit gave reliable service, but it has many, many hours on it and it lacks the fault/self control circuits needed for remote (read desolate) operation. Several times over the last few years, the generator would run out of gas or the propane tank would freeze up and the starter would crank until it burned out. It was cold out on the island, with temperatures in the twenties and a bitter west wind blowing right into the generator shack. All of this conspired to make working conditions difficult. Wind chill readings were in the single digits all day long, and in spite of long johns and extra layers, by 3 pm I was shivering and even several hours after coming inside, I still feel cold. The new generator is an Cummins/Onan 20GGMA which is rated for 20 KW. We used a John Deere bucket tractor to move the generator from the flat bed truck to the generator building, then push it inside. The old generator wiring to the transfer switch was reused, but a piece of flex was used to connect to the generator instead of the solid conduit. The building fan was also wired up so that it will run whenever the generator is running. The generator load with all possible things switched on and the transmitter running at full power is about 12,000 watts, but this would mean the air conditioner and tower lights were on during the daytime. More likely, the transmitter will be at low power when the tower lights are on and the AC will be intermittent on/off at night. 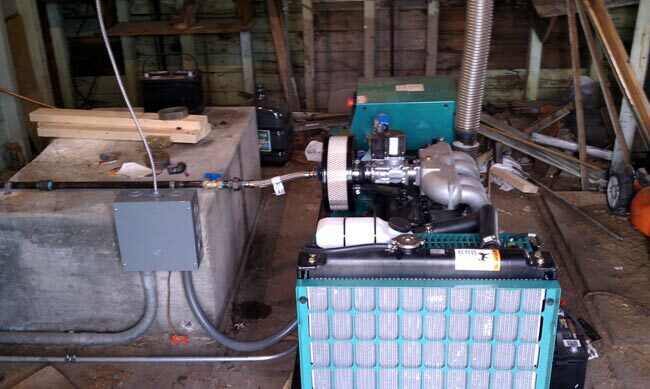 At full load, this generator uses slightly less than 2 gallons of propane per hour. At half load, I’d estimate that to be 1.4 or so gallons. 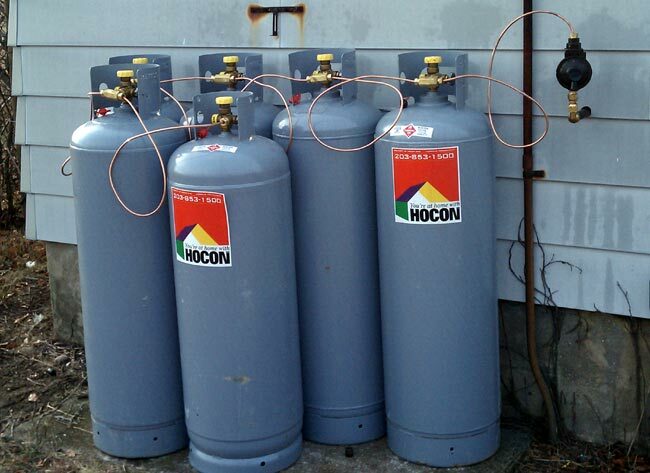 HOCON gas came out and connected six 100 pound propane tanks in series, which should prevent tank icing. Propane weights about 4.11 pounds per gallon, therefore the fuel supply should last about 100 hours, or 4.5 days, give or take. Why 100 pound tanks? Because we will have to shuffle them back and forth between the dock and the generator shed, a journey of about one mile, in a cart. Anything larger would be impossible to deal with. Even so, refilling the propane will be a 2 person job and will likely take all day. Shortwave broadcasting is often overlooked as a domestic news outlet. 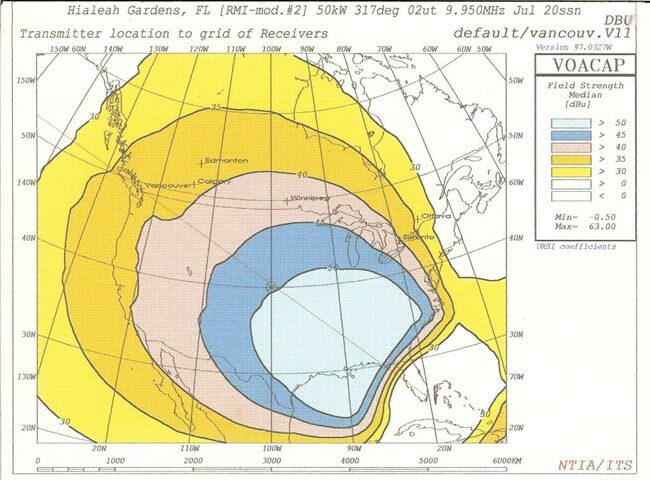 This is by design and is a throw back to the cold war era when shortwave broadcasting was seen as an international propagation outlet, mainly used by the VOA. In fact, according to the Smith-Mundt Act of 1948, the Voice of America is forbidden to broadcast directly to American citizens. The intent of the legislation is to protect the American public from propaganda actions by its own government. Nice, huh? 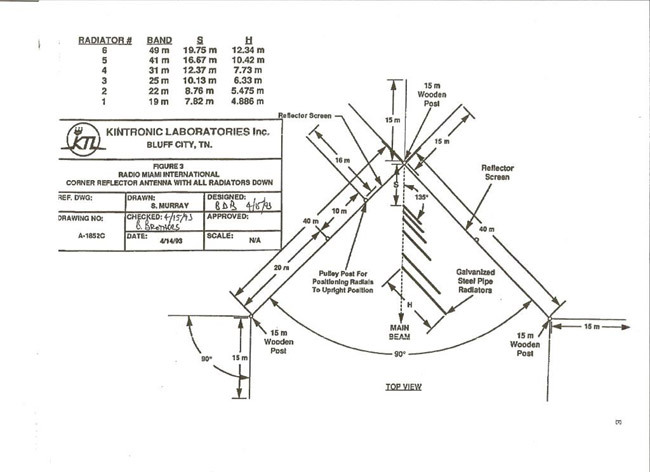 The way the FCC rules governing shortwave (AKA HF) broadcasting are written, the station needs to be designed and configured to transmit signals to areas outside of the US. Any coverage within the US is considered incidental. See also CFR 47 73 part F.
That being said, many of the non-VOA HF broadcasters are well received in the US. There is nothing that is preventing a shortwave station on the west coast beaming it’s signal across the North American continent to Europe, or over the poles, etc. These stations’ call signs start with a K or W much the same as FM and AM broadcasting stations. Most of them are religious broadcasters, however, there are a few that offer non-religious programming or a mixture of both. As Clear Channel lays off more staff and becomes a computer automated shell, I am beginning to think that traditional AM and FM broadcasting is on the way out. Television news and the 24 hour news cycle has blurred the line between journalism and opinion. Newspapers have filled the role of government watchdogs and general information sources since this country was founded. Newspapers have fallen on hard times with many cutting investigative reporters, general reporters and or going out of business. The internet has become the defacto information source for many people, which is fine so long as users understand its limits. The big problem with all of this is the internet is a fragile thing, controlled by a few very large companies. A few keystrokes and a router table is re-written to exclude a site that might have detrimental information. Distributed Denial of Service attacks have taken down Wikileaks for days. Collateral Wikileaks related damage occurred to Amazon.com, Visa, Mastercard and Paypal. A few “persuasive” calls from an important government agency or official to a ISP or server company can easily take a site or multiple sites off line. Search results can be skewed by search engines, or by large companies like BP did during the Gulf oil spill. The FCC debates on so called “net neutrality” have yet to produce any meaningful frame work to avoid corporate and search engine censorship. This also assumes that the government can justly regulate the internet, which, in this day and age is a stretch of the imagination. All of this is leaving an information void. As the saying goes, nature abhors a vacuum. Enter Shortwave Radio. Now, I’ll be the first to admit, there are a lot of strange things that can be heard in the shortwave broadcast band. However, it one can separate the wheat from the chaff, some rewarding entertainment can be had. Most of the non-government shortwave stations in the US are religious broadcasters. There are at least three stations that offer time brokered programs, some religious and some not. WBCQ is always a good bet. WRMI is offering more and more non-religious programming. WWCR also has some general programming. While government broadcasters like the BBC, CBC and others have greatly curtailed their broadcasts to North America, this is not necessarily a bad thing, as other smaller broadcasters can be heard where the giants once roamed. As solar cycle 24 heats up, the programming selections on any given day can vary widely. Radio Australia (ABC) has been booming in on 6020 KHz in the mornings around here. They have an excellent country music program and I have been introduced to several songs and musicians that I would not have otherwise heard. Today I heard a great show on Radio Australia Today about New Orleans, Ray Nagin, the aftermath of Hurricane Katrina and lots of things that haven’t aren’t normally heard here in the US. Key to shortwave listening is the receive antenna. One particular MF/HF receive antenna is the K9AY loop. I have had very good luck with that antenna on both standard and international broadcast. I have to say, I am finding fewer and fewer things to listen to on the AM band. I have taken the opportunity to make a few circuit boards with a 10-12 dB preamp for controlling the pair of loops used in a K9AY array. The preamp is based on a common base Norton design, which has low noise and moderate gain. I use the preamp sparingly, the main reason for it is the 4 way hybrid splitter, which adds 6.2 dB of loss to the antenna output. Still, I have noticed, especially on narrow bandwidth digital signals, the preamp can mean the difference between decoding a signal or not. I am making extras, K9AY antenna systems, preamps, receiver splitters and other general shortwave receive systems, which I plan to offer for sale at a later date. As they say, stay tuned.